I left Budapest in July 2017 after 3.5 years of living in this beautiful capitol. This is a part 2 of my series about the reasons that led me to quitting Budapest. Read the first part about how the city changed, and how tourism shapes it. Or just be a rebel, and read the second part first. Right now. Living in the heart of Budapest has endless advantages, but brings surprising disadvantages, too. The city centre is just so attractive to the burglars. It happened to me several times that somebody was robbed in the building I was living in. Once, I even distracted the thieves from breaking into the neighbouring flat. On the day when the neigbours moved in! This has a simple solution – bars. Never have I ever felt like a bigger prisoner. Even if you live in the 4th floor, you would still get them. The police seem to be clueless, or not very determined. Regardless of what’s the true reason, the only working solution has been to put a horizontal bar on the entrance door. And ideally have your landlord pay for it. Dear Budapesters, if people speak a foreign language, it automatically doesn’t make them an unbroken piggy bank waiting for you to slash it with a hammer. Has it ever crossed your mind that these people that address you in bad Hungarian (or even none at all) are working in the city, and earn the same lousy salary like you, or your grown-up kids? Paying the Everest taxes, and thanking you for ripping them off because they just cannot, or do not want to fight back to not sound disgraceful? Do not create double standards. Just don’t. I love doing grocery shopping in France. Partly because of the wide selection, but also because of the food quality. I am not making this up, but there is a substantial difference between the products that are on shelves of Western and Eastern European supermarkets. It is probably one of the very first topics that the Eastern European EU nations brought to the table for discussion by themselves. The truth is that the shopping options in Hungary are super sad. It has happened to me on multiple occasions that I planned to cook some meal, but because the shop either didn’t have the ingredients, or they were of poor quality, I had to change my plans on the spot. Have a look. 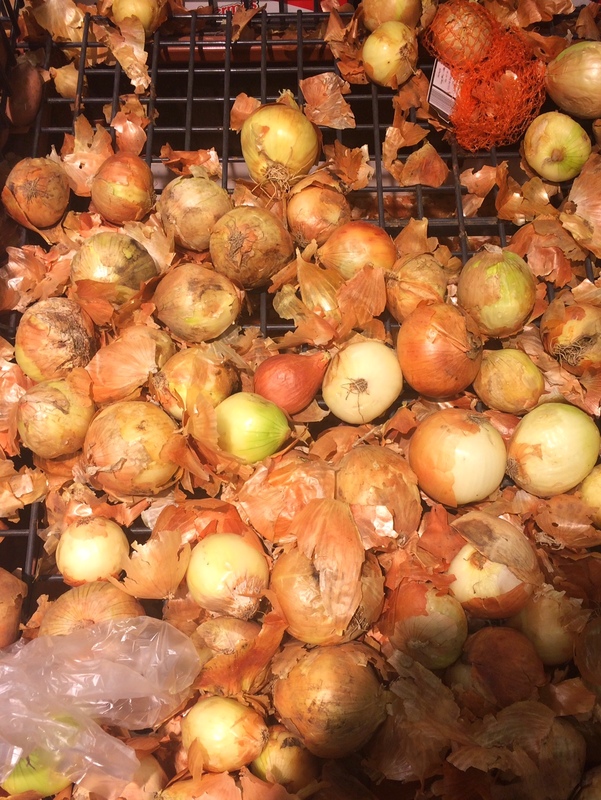 Would you choose any of these onions? I didn’t choose any of these onions. Judging from the empty plastic bag left there, I was not the first one to try. I know, there is always an option to go to the farmer’s market once a week, and buy all the vegetables and fruits. Or Lehel tér market, where I always mysteriously manage to spend a fortune, and bring back home some rotten pieces too. I repeat. Do not create double standards. I have a working theory that the fruits are of lower quality because all the good ones were already left at closer stops from the farm. Plus the transport doesn’t help since the distance to Hungary from Spain is huge. Especially for exotic fruits. I was surprised to find out that the mandarins Clementine are sold with a nice fresh green leaf in France. You would search for that in vain in Eastern Europe. Certainly, not commonly on the shelves of Hungarian supermarkets. However, to be fair, Hungarian tomatoes, that’s a different story. Juicy, red, perfect! I will not miss the shopping in Budapest. On the contrary, I happened to do my groceries in some Czech stores, and could easily compare. I think Czech shops have substantially improved in the overall customer-friendliness. There is a wider selection of products too. It is still miles far from where France shops are. But, with a bit of luck, shops will be history in the near future. Just VR. Taxes are essential for the state to function, I know. But does the state really need to get so hungry, like Hungary? The income tax together with contributions to the striving healthcare and not-so-functional social system (read on) are one of the highest in Europe. On top of that, the VAT is 27%. There is also a bank tax of 0.6% from every transaction. The money gets taxed here a lot. But where does it go? Believe it or not, the governmental PR campaign was happening every single spring. Sometimes it was supplemented with a referendum, too. Usually such governmental campaign, would be countered soon by an anti-campaign. Usually by different opposition parties (Jobbik campaign was quite aggressive this spring) or of other involved parties. In particular, I enjoyed the satirical counter-reactions of the Two-tailed dog party (MKKP), and I apprehended a lot of Hungarian thanks to all those campaigns. I experienced 4 different campaigns during my 4 springs in Budapest. The last one, against George Soros was the most aggressive and sick-minded. 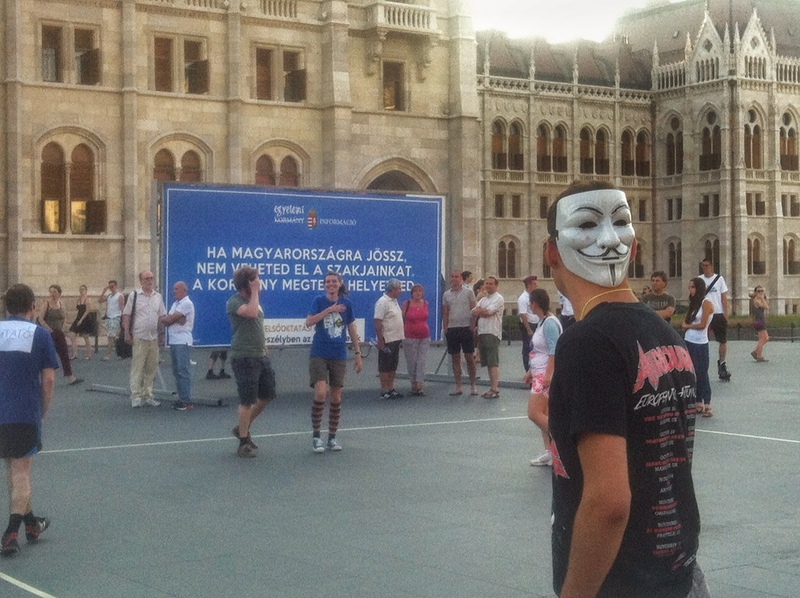 However, the one attacking foreigners (“If you come to Hungary …”) was also unforgettable. If you haven’t had the chance, check it out now. Let’s not let Soros to laugh as the last one! This campaign was by far the most targeted against an individual. Reminds me of the dark times in the last century. Racist, and wrong on so many levels. George Soros is not responsible for your lousy lives. You are. Where is all that money going to? Yes, there are quite some people enjoying their retirement. The big baby boom happened a bit earlier in Hungary than in Czechoslovakia. Sadly, many of those pensioners are not able to sustain a good living from the pension they are getting with the increasing costs. As a result, many of them still need to work. They are either cashiers, ticket controllers, or security guards. Once, late at night, I saw an 80-year old grandfather sitting behind the cash desk of a local discount store and sleeping. Given he was wearing a guard uniform, I guess he was on a night shift. Instantly, I felt sorry. I believe he should be in a real bed. And not “guarding” a shop downtown Budapest that is equipped with strong slide bar door, alarm system, and monitoring cameras. This just doesn’t feel right. I heard somewhere that Hungary has the highest number of people employed in security services in Europe. Do you know what is the problem with jobs as ticket controller or security guard? They don’t create any tangible value. These are jobs for jobs, which will hardly make Hungary great again. During my time in Hungary, I had to say goodbye many times. Hungarians are in masses leaving their country, and logically this had to impact me as well. Exactly 18x. I counted it. And to be fair, not all my friends in Budapest were Hungarian, but a vast majority of them were. And quite some of them left before me. The good news is that it is still possible to flee. So, I kind of understand the urge to do so. The life in smaller cities is not always cherries especially when the job offer is limited. The capital is a bit pricey for the low salaries you get when you are just at the start of your professional career. And since Hungary is a part of the EU, moving to live and work abroad has never been easier. I did the same. Thank you, European Union for making it easy to leave your home, and live somewhere else on the good old continent. At least for 1,346 days. Now you get the idea what is the composition of the Hungarian society. Visually, there is more older than younger people. This is more visible in smaller cities. Yet, this is harder to see in Budapest with all those tourists and university students (emptying the countryside). But, you have an all new tribe of people living in Budapest. These are the homeless. You wouldn’t believe how many there are. The city and building owners are trying to prevent them from sitting by the buildings, which makes Budapest look like a ghost town. Corner of Bajcsy Zsilinszky and Alkotmány utca, 500 m from the iconic parliament. 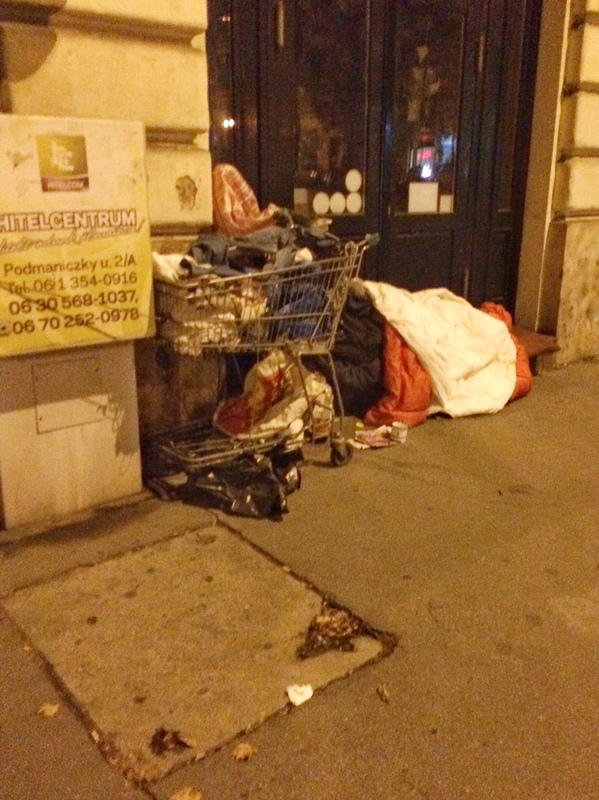 The homeless camp instead in the metro and building entrances, under bridge overpasses, and form little colonies in Budapest parks, and ruined buildings. I know that the problem of homelessness is not particularly high on any governmental agenda, because these people do not vote. However, in Hungary, the situation is getting critical. I have seen homeless people of all ages, but also women in their sixties, and younger ones with kids. And this is how the side streets of Budapest look like when the night falls. I am getting a bit more worried after I spotted the government’s resentment of the work of NGOs. Non-profit organizations are mostly the ones trying to save the day in Hungary with regard to this issue. It would be very short-sighted to complicate their field work, especially if you as a state don’t wish to replace them in pursuing this mission. Just don’t. Back to Budapest, it actually resembles a ghost town for one more reason. There is an incredibly high amount of buildings that are falling apart. Many still carry 1956 revolution shells in their walls. I will never understand how one can be so patriotic, and at the same time would let the country’s heritage decay so much. 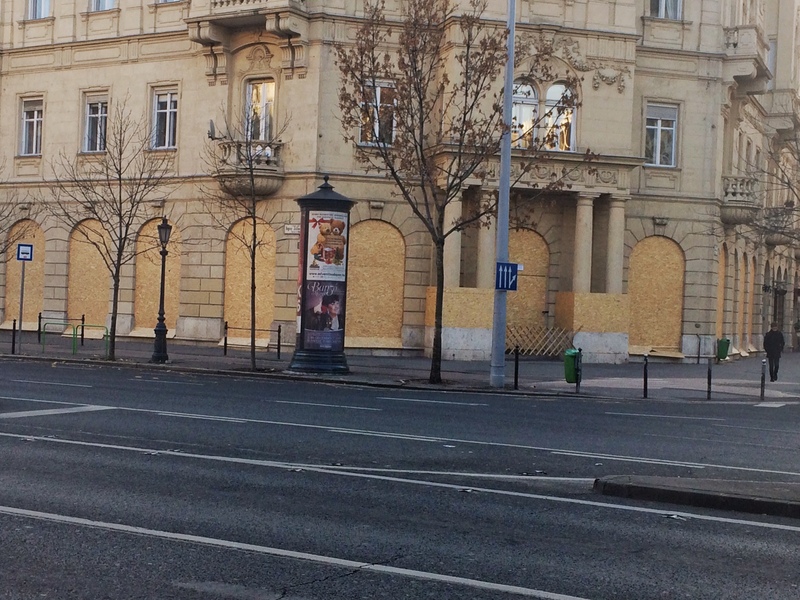 This is a big shame of Budapest, and I hope to see the building getting fixed rather than having more and more wooden scaffolding built around them. The housing costs in Budapest have skyrocketed over the time I lived there. The reasons are the same like in Prague: Airbnb and small offer. Not so many new apartment buildings are being finished, while the city centre flats are used more for the Airbnb. One thing that is striking like an elephant in the ZOO pool, is the abundance of empty buildings in the city centre of Budapest. Why? If you know the answer, leave me a comment below this post. I am really curious. And last but not least, it is the politics that makes me feel that Hungary is not the best country to live in the future. It always gives me goose bumps when I hear the future Czech prime minister saying that he envies Viktor Orbán, because he doesn’t have the Senate to answer to. And it makes me super happy that we do have it in the Czech Republic. The image of Hungary is very distorted in the Czech media, many events are not covered at all, or only very superficially. But by living in Budapest, right by the Parliament, I witnessed many demonstrations and protests. Be it the medical personnel, students, teachers, NGOs, journalists. Some were planned, some not (RIP Népszabadság). Teacher protest at the Kossuth Lájos Square. Playing football to draw attention to the massive governmental support for this sport. You cannot create a confident nation if your education is not thriving. Every time Viktor Orban’s government manages to dismantle another piece of Hungarian democracy, I wonder, what will be next. And I always get surprised. After the hot April with the attacks on the CEU, press freedom and NGOs, I said to myself that this is the last drop. 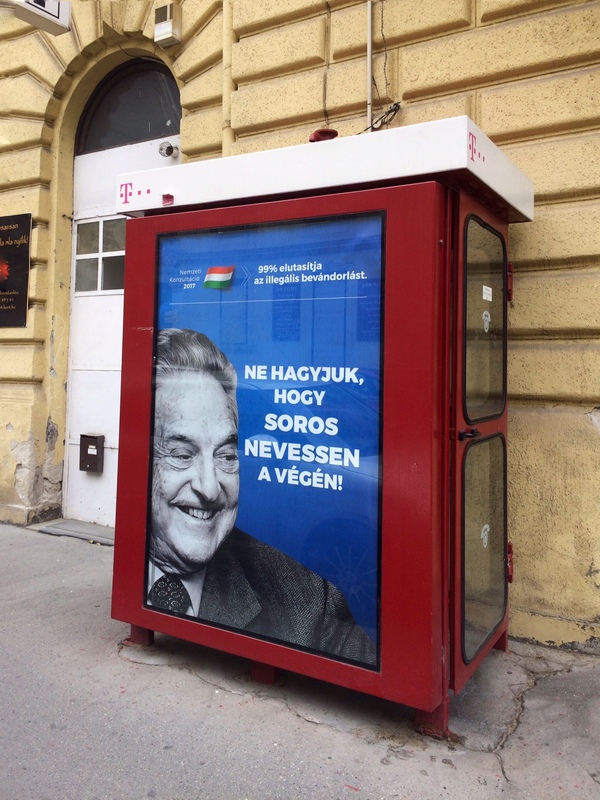 I do not want to participate by giving away my tax money to a government that is using them to put posters saying that I shall not steal the jobs of Hungarians, and should respect the culture. Too absurd even for a Czech. Hatred is being sown in Hungary, and I believe the harvest will be tough. And frankly, I am not interested in being attacked one day for being a foreigner, “migráns”. I had a blast living in Budapest, I am very grateful for this life experience, but this chapter is closed now. Time to move on. Where to? Follow my life trip from the North to the South of America. Liked this article? Why not sharing it with your social bubble? Disagree with some of my observations? Drop me a comment below. Be a rebel for the second time and read part 1. No time to read it now? Nevermind. I know that there is way too much other distracting things around you right at this moment. Just pin it, and come finish reading it later. Dear Katechka. Your writing about why you left Budapest is full of negative generalizations, therefore it loses credibility. Of course, you can usually get away with this if it’s done in good humor. Now this part is subjective, I know, but so far not one smile has come to my face. So what I experienced is just a bitter attitude that won’t even make me smile or think. A lose-lose scenario. Sorry to say, I just hope that in your new home you’ll be able to approach things in a more constructive way. Sorry, Bill, that I didn’t speak to you. Try checking some other pieces I have written about Budapest. They are more lovely, surely! What exactly is not true or overgeneralization in this post, dear Bill? Bad things are just bad, they cannot be approached in a constructive way. Also this was not a satire so it shouldn’t make you smile. A simple “why” post like this doesn’t have to be thought provoking either. It just states a question and answers it. Yes it is subjective but being a Hungarian who commutes to BP every day, I can say most of it is true. Very long and thought provoking piece. I find this particularly interesting because I’m also a foreigner living in Budapest for the past 5 years and still living in the middle of Budapest! Sadly, most of these observations are true, especially the political situation surrounding migrants and foreigners and the massive media brainwashing campaigns. This is building a negative momentum towards foreigners among most Hungarians that will be impossible to overturn later. In this regard, this article is contradictory – it admonishes locals to not allow tourists (or foreigners) take over their city, yet complains when confronted with the realities of locals doing exactly that. Thanks for sharing your perspective, I’m sure many will find it useful. Wishing you the best in your life journeys! Thank you for your comment, Steve! This article was meant to be a food for thought about how it is changing. Not sure about the contradiction, I don’t think that it is right to scam tourists under any circumstance. However, I do see a growing number of locals that can afford living centrally or near centre. This is essential for keeping the city theirs. Just as I was writing. Good luck to you too! Thanks for stopping by and leaving a comment. Having lived in Budapest for 5 years as a foreinger as well. I have read through your both blogs and can say I agree with nearly all and can really understand your reasons to leave. I had similar double feelings and thoughts after 5 years. The country does not seem to move forward in any sense but rather backward in time. Thank you, Dennis for this comment! You summed it up better than me – I do not see the country progress. Yes, money is invested (coming mostly from the EU), but not sure about the mood and attitudes of locals. Especially with so many of them fleeing it. That says something too. I just finished reading both parts of your article, and as a foreigner living in Budapest for 4 years now… well, it pains me to admit it, but I agree with some of your points, especially those concerning the current political climate. There’s so much to love about this city and I would love to put roots here with my partner but… it’s hard when the official messages you hear focus on how horrible immigration is. I know of so many Hungarians living abroad who would love to come back, but the sorry state of the economy just doesn’t allow them to think of making a living here. As for your concerns about tourism, we generally avoid the “party” district unless there’s a specific bar we want to check out, and live on the Buda side. Pricier yes, but much nicer to live in, and public transportation being as good as it is, I really don’t miss not having a car at all. Well many who left just wanted more money, it is not like you cannot make a living of you want to. But many people left solely because of political reasons. They just don’t want to live in this country anymore, with this government, and with the general attitude of the average people.